There is something to be said about France. Paris, beyond the clichés, was at times hot, smelly, and dirty, but there were moments of pure bliss in my recent 48-hour trip there for a book launch. They launched the (academic) book, I provided a commentary. The best combination! My own (third) book doesn’t seem to be getting off the ground anytime soon, so it was fun to celebrate other people’s success and achievement. The fact that it took them almost eight years to write made me feel a little better about my own procastination. Apart from a couple of hours of playing at being a French public intellectual, and seeing as I didn’t have much energy for jostling the crowds seeing Cultural Things One Ought To Go And See In Paris, I just bummed around in cafés sewing. Now that, believe me, is the best way to enjoy France! 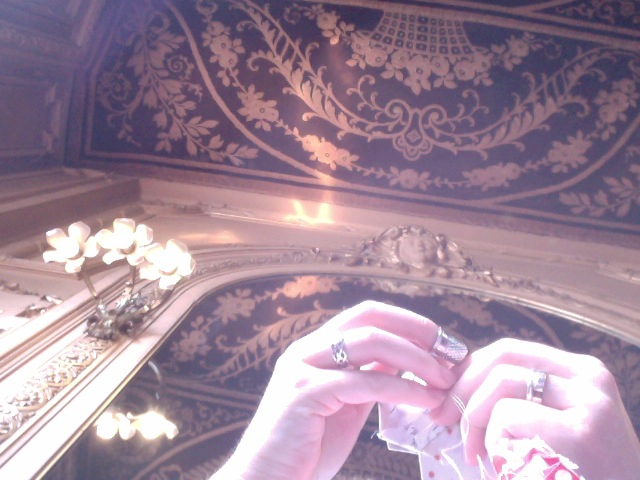 This was in Le Train Bleu, a divine restaurant / bar / lounge in the Gare de Lyon. An oasis of peace, far from the travelling crowds. I had the best of two hours of stitching, discreetly listening in to private conversations around me. Were they on a first date? A business trip? Would that young man move back in with his mother, as she was suggesting? It was fun to speculate. In another café, a couple of teachers at the end of a long term were endlessly complaining about the latest educational reforms, and plotting escape. I suspect they do this every year, but then diligently return in September, after a few weeks away from the relentless pace of classrooms. I suspect I am the same. 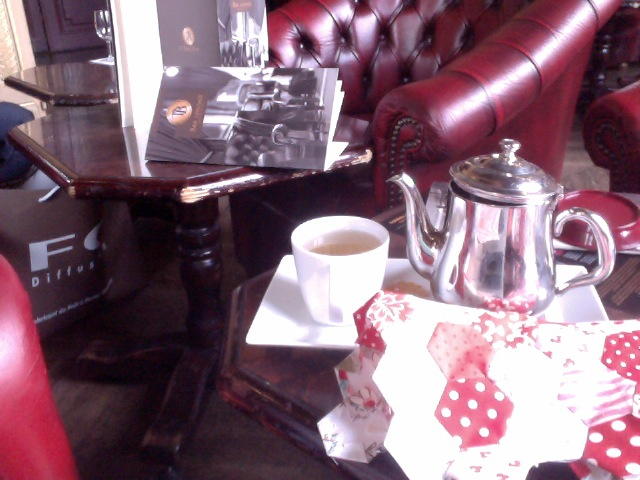 So sipping tea, and nibbling cakes in various places, my hexies came together, and my neighbours provided discreet entertainement, writing a novel of near-encounters. I am obviously old enough not to get hassled by French men anymore, even when sitting alone for an hour or so. Bliss! I even got time to go and buy some Provençale fabric in Le Rouvray, the owner of which seemed that wonderful Parisian combination of rude, sulky but potentially passionate. She certainly, shall we say, took some mollifying. The place was packed with excited tourists, mostly American. 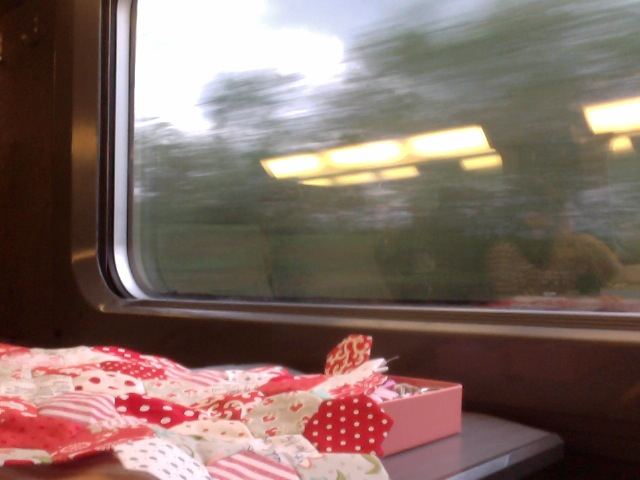 I was pleased to pick up a lovely bundle of French fabric which is surprisingly difficult to find. But I think that I probably ought to stop buying material because I have one thousand projects I wish to work on, but of course cannot quite find the time for. 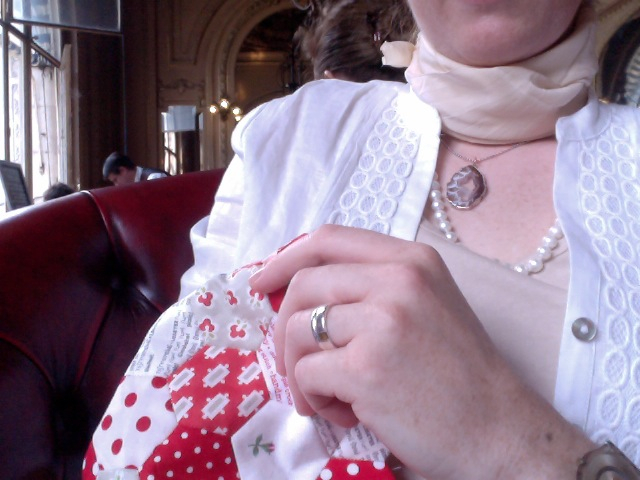 Oh well: stitching scrappy hexies in cafés is a good start, and delightfully restful. On the way back, when I got bored with my newspaper, I did some more. Life could be worse! 4 Responses to Dahling, it’s Pareee!